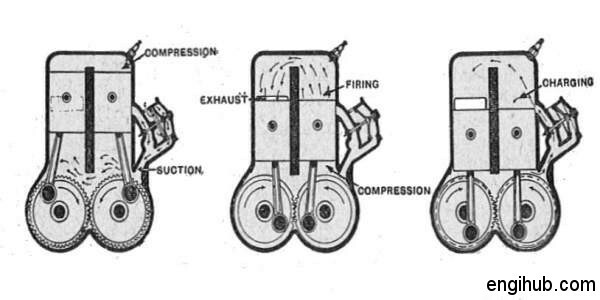 The two stroke cycle engine completes one working stroke in one revolution of a crankshaft. In four-stroke cycle engine, there is only one working stroke in each cycle. It means two revolutions of the crankshaft are required to produce work in each cycle. The desire to have one working stroke per cylinder for every revolution of the crankshaft has forced the engineering people to develop two stroke cycle engine. You have a choice of engine selection as there are two types of engines in operation. In 1838, Barnett an Englishman describe the mechanism for supplying a charge to the cylinder by means of separate pumps, the fresh charge of fuel, displacing the product of the previous charge. Dugald Clerk also made a lot of contributions in this direction in 1878. Two stroke cycle engine is very widely employed where small power required for motorcycle, auto rickshaw, scooters. Two stroke cycle engine is compact in size, easy for manufacturing and simple in operation. One drawback of two stroke cycle engine is, Specific Fuel Consumption (S.F.C) is more. (Means fuel per Break Horse Power (b.h.p.) per hour is more in two-stroke cycle engine. 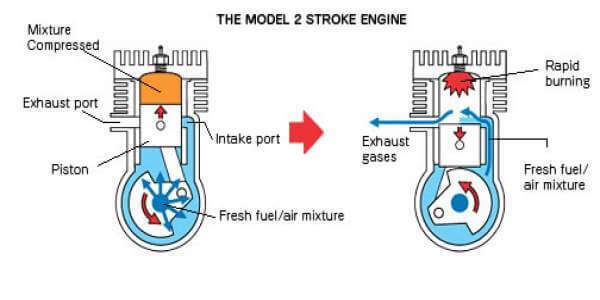 There are no inlet and exhaust valves as in four-stroke engine but we have inlet and exhaust ports only, due to which suction and exhaust stroke are eliminated in two stroke cycle engine. Here the burnt exhaust gases are forced out through the exhaust port by a fresh charge of fuel which enters the cylinder nearly at the end of working stroke through an inlet port. This process is called as “Scavenging”. You can read the details about Scavenging from below. As I told above, two stroke cycle engine has no valves but consists of the inlet port (IP), an exhaust port (EP) and transfer port (TP). The ignition starts due to the spark has given by spark plug when the piston is nearing the completion of its compression stroke. As a result, the piston is pushed down performing the working stroke and in doing so the air-fuel mixture already drawn from the inlet port in the previous stroke is compressed to a pressure of about 1.4 kilogram/ centimetre square. When 80% of this stroke is completed the exhaust port is uncovered slightly. Hence some of the charge of burnt gases escapes to the atmosphere. As the exhaust port is uncovered by the further downward movement of the piston, the transfer port, which is slightly lower than exhaust port, is also uncovered. A charge of compressed air-fuel mixture enters the cylinder and further pushes out the burnt gases out of the exhaust port. To facilitate the deflection of the fresh charge upward and to avoid its escape along with exhaust gases, the top of the piston is made of a particular shape. From the bottom dead centre, when the piston moves up, it first closes the transfer port and then exhausts port. The charge of fuel which previously entered in the cylinder is now compressed. When the piston is nearing the upward movement the inlet port opens. A fresh charge of air-fuel mixture from the carburettor enters the crankcase. After the ignition charge takes place the piston moves down for the power stroke and thus the cycle is repeated. It can be fairly assumed that the crankcase and the bottom of the piston from a compressor assembly. In which the work used up in compressing the charge is negative. The top of the piston is considered as positive and crankcase is as negative. The difference between the positive and negative loop gives us the network available from two stroke cycle engine.